One of my earliest Christmas memories was not a particularly good one. I was raised by a single immigrant parent whose family of origin didn’t celebrate Christmas. Sure there was gift-giving and maybe even a tree, but there was no Santa and certainly no talk of Jesus. I don’t know exactly how old I was but I remember my first awareness of Santa. I remember how excited the kids at school were that Santa was coming. I saw the cartoons depicting Santa as a big jolly stranger who came magically down a chimney, out through the fireplace, and left presents under the Christmas tree. It was too good to be true and yet, I remember the hope and excitement I felt that Santa would be coming to my house too. Then panic hit. We didn’t have a fireplace! So on Christmas Eve, after leaving a plate of cookies, a box of Smarties (an extra special treat for Santa because this would be his first visit to my house),a glass of milk and a carrot for Rudolph, I unlocked the front door so that Santa could still get in despite the absence of a fireplace. Of course I didn’t tell my mother any of this. She didn’t see the goodies I left out because I hid them on a small table beside the tree. And as my mom did every night, she locked the front door. When I got up on Christmas morning there were no presents under the tree other than the ones that were there the night before. The cookies, milk and carrot were still there. Even the Smarties were still there! I ran to the door and sure enough it was locked! How could she do this to me? How could my mother lock Santa out of the house? I was miserable. My mother was confused. It was not a nice Christmas. I suppose it was unfair to blame my mom for my profound disappointment, but what was a kid who wanted more presents to do? At whatever tender age I was at the time, I learned the truth about Santa. I also learned that when we put our hope in the wrong things we are often disappointed, even hurt. Eventually, I put my hope and faith in God. A God who is real, not like Santa. A God who is always there, not like Santa. 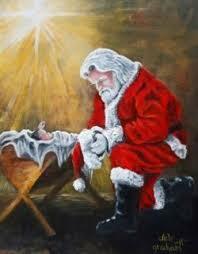 A God of abundant love, joy and hope, not like Santa. Santa could never make promises like those found in scripture. This Advent season don’t put your hope in things that will disappoint. Put your hope in Jesus, Immanuel, God with us! Question: What did I leave out for Santa? Answer: Plate of cookies, a pack of Smarties, a glass of milk.